I was once invited to audition for a TV show and, during my screen test, I experienced the most epic brain freeze that has ever been experienced by a human being. Ever. I was so nervous I could barely remember my own name. Needless to say my TV career was over before it began. I have lots! Gabby, Gab, Gabs, Gabster, Booti, Boots, Grabby, G-Unit, G, G-Mac, G-Tozer, McMills, Mama, Mrs Tozer, Mrs T … I was even nicknamed Colin when I was in Year 12. Warm, fun and punchy, with a hint of the ridiculous. Passionate. Focused. Entertaining. Weird. Dreamer. Hermione Granger from Harry Potter – I’m a goodie-two-shoes know-it-all bookworm from way back! The early ’80s – the pop music was awesome, the hair was huge and curly, the clothes were daggy (hello, epic shoulder pads!) and I could party with my parents who would have been in their 20s. Then, I’d squeeze in a quick visit to 3014 to see what’s happening on Earth. As a kid, I loved reading anything funny and outrageous by authors like Paul Jennings, Morris Gleitzman, Roald Dahl and Margaret Clarke. While The Intern is for a slightly older audience, I like to think they have encouraged me to include a whole lot of hyperbole, fun and ‘She did what?’ moments in my writing. My love of reading! I’ve always loved books and I think it was a natural progression. One minute I was reading The Baby-Sitters Club, the next I was writing The Baby-Sitters Club fan fiction. From there, I dabbled in my own ideas and the rest, as they say, is history. I’ve also been nurtured by some wonderfully creative teachers along the way, including my Year 12 English teacher Cathy Edwards, and my scriptwriting lecturer Felicity Packard. ‘Menagerie’ – I’m yet to use it in a novel, but I’ve loved it ever since I heard it in Disney’s Aladdin. Toughest question ever! Maybe Stephen King’s On Writing. Or Roald Dahl’s The BFG. Or John Marsden’s Tomorrow When The War Began. Or The Book Thief, Hunger Games or Harry Potter or… or… this is too hard. I’m greedy and want All The Books, sorry! 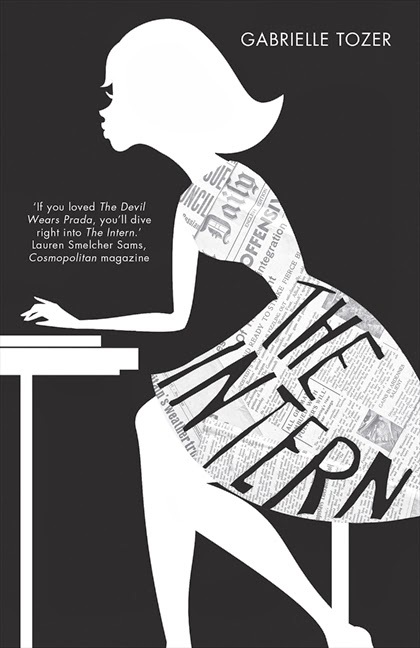 Gabrielle Tozer's debut YA novel, The Intern, was released by HarperCollins on 1st February 2014 and is available at all good bookstores and online for $16.99 RRP. A sequel to The Intern is already underway. Visit Gabrielle's website or follow her Facebook page to keep up to date with her latest book and writing news.